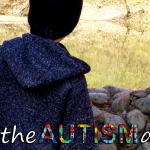 Over the many years that I’ve been writing about our Autism journey, I’ve tried very hard to help people understand the very basics of how Autism can impact a family. Unfortunately, that effort hasn’t always been successful. When the people in your life don’t understand, it only serves to make life that much harder. 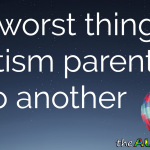 Autism Parenting is so incredibly overwhelming and feeling like people don’t get it or worse, they judge you, makes things so much more difficult. 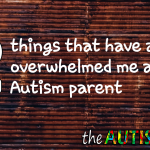 Autism parenting is overwhelming for a million reasons and those reasons may vary for everyone but I can at least share why it’s so overwhelming for me. I don’t think there’s a day that goes by where I don’t feel completely overwhelmed by all the responsibilities I have. I feel like I’m in a constant state of fight or flight because I’m always on edge. 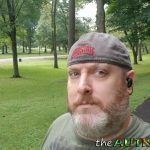 As a parent to three boys with Autism and various other special needs, I have to think ten steps ahead of the kids as well as physically be ten steps ahead of the kids. Without doing that, it’s nearly impossible to ensure their safety. Everything that the rest of the world tends to take for granted, is something that I either never get to experience or have to wage war in order to get for my kids. I worry about my kids from the moment I wake up to the moment I fall asleep at night, assuming I even get to sleep at night. Speaking of that mysterious thing called sleep, if or when I find it is entirely dependent on if or when my kids do themselves. I’ll be real upfront and honest, if you look up chronic sleep deprivation, you’ll see my picture there. I can’t even begin to explain the sheer level of exhaustion that is a byproduct of chronic sleep deprivation. Even if sleeping at night wasn’t a problem, taking the kids to all their therapies, doctors appointments and simply trying to stay a head of them is exhausting enough. That doesn’t even take into account trying to meet all their unique physical, emotional and sensory needs. The reality is that each one of my three kids is unique in every way. Saying that everyone with an Autism diagnosis is the same is like saying every person is in the world is the same because we’re all human beings. Sure there’s things that are common across the board but that’s about it. Each one of my kids have unique and oftentimes conflicting needs. This means that by providing one of my kids with something they need, I can be causing distress for one of my other kids. 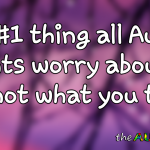 This is especially true when it comes to their sensory processing needs. I have to make at least three different dishes for each of the three daily meals (often multiple times) because no one will eat the same thing and if I don’t cater to their food proclivities, they will go hungry. Kids with sensory related food proclivities will not eat sensory offensive even if they’re really hungry, anymore than you or I would eat a cat turd out of the litter box. This is something that happens every single day of my life and if I don’t cater to my kids unique needs, they’ll end up losing more weight. This is a serious problem. Few things are as fun and rewarding as powerlessly watching my oldest child go through a psychotic break for the umpteenth time. That’s sarcasm by the way. It’s truly one of the most heartbreaking things I’ve experienced in my life. Then of course there’s all the medications and treatments I have to perform daily or weekly, to battle the things that make my sons physical and emotional health so fragile. I have to stay on top of and properly manage roughly 30 different medications between myself and my three kids. That’s daily and sometimes multiple times daily. I routinely battle insurance companies, fight for what my kids need in school, deal with ignorant people in the public arena who are all too willing to share their opinions of my kids with me, manage the inevitable daily meltdowns over things I oftentimes have zero control over and go to the ends of the Earth and back to meet sensory needs that are damn near impossible to meet. Don’t even get me started on getting some of my kids to actually wear clothes, shoes or socks. Seriously, that’s in a whole didn’t Universe of difficulty. What I’ve written above are just the things off the top of my head. I didn’t get into the guilt because that’s a post by itself. There are a million things that are just as exhausting and overwhelming for me that I didn’t mention. I’m so tired all the time and even when I sleep I don’t sleep well because I have to sleep with one ear open. Finally, I wouldn’t be doing this post justice if I didn’t mention something that no one wants to talk about and that’s the physical and emotional health of the parent. In this particular case, that would be me. I would be remissed if I didn’t talk about how all the stress, anxiety and constant state of hyper-vigilance impacts me as a person. Aside from stress eating and totally lacking anything that even resembles energy, I’ve also been waging a war with Depression. This has been a longtime war but it’s absolutely harder to manage when I’m constantly buried by all the things I need to do, all the things I’ve failed to do and all the things that I worry about. This is just a portion of my personal experience and keep in mind that this doesn’t even touch on all the everyday life things that I do my best to muddle through but typically have to back burner. I don’t know if this is something that is easily understood but I would think that at least someone out there can relate and if you can, please leave a comment below. Actually, I’d love for everyone to leave a comment and simply share your thoughts, opinions or questions. You are doing a great job. Keep up the hard work. Reading these comments….dont you love parents with typical children giving you advice on autism? Clueless morons…. If I may offer a piece of unsolicited advice, please take care of yourself. So often we get caught up in the putting our kids first thing, that we neglect ourselves. If something happens to us, who will be there for our kids? Best wishes and I hope you continue to share here..
Nancy, as an autistic person myself, now in my 40s and living independently (successfully most of the time with some basic support) I feel very deep compassion for Rob and his struggles. My mum was a widow, employed full time and raised 2 difficult children on her own, and it wore her out. This was before the days of OT and knowledge of SPD etc. But as much as I appreciate your difficulties I find it hard to hear you without anger, Nancy, if you call autism an “epidemic”, because it means you have allowed yourself to buy in to a perspective on autism that is not in any way constructive for you or your child. You claim that you are pushing yourself to learn more about autism, but that is clearly not from autistic people. Please move out of your echo chamber and broaden your search. Engage with autistics to learn what we have to say (Yes, even non-verbal autistics have blogs and use social media). There may be things Rob could be doing differently to help his children – I am not fully aware of what supports and therapies he does use – to make their and his lives easier, but I can see he is trying very hard in the face of very difficult circumstances. 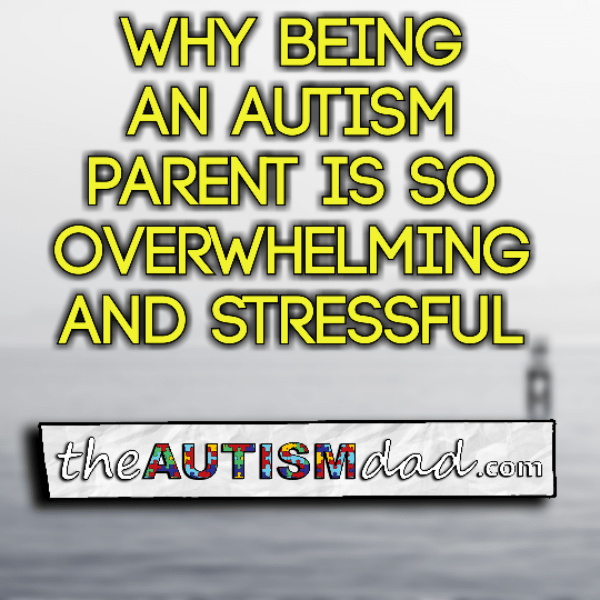 Many autistics would attack and judge him for speaking about his difficulties in public as it can be seen as playing into a negative narrative about autism and the parent victim mentality, but in my view stressed parents do need to vent about their frustrations in raising us, so long as there is balance. We do get tired of hearing how much of a burden we are on our parents and society, and I think we have a right to do so and to complain a bit about that ourselves, too: there are 2 sides to the story and we also have feelings that can be hurt. Most of us are only too aware of the hell our families go through, and we go through hell ourselves. However, I think we are also justified in insisting that you do NOT refer to us as having a disease that needs to be cured (an epidemic), somebody’s fault (we aren’t) or patronise and infantilise us with language like “playful and caring and smart” when you use language that betrays hate, lack of acceptance and lack of compassionate and informed understanding of autism. Am I judging you, Nancy? Yes, I am and I make no apologies for doing so. I hope that you will come to stop blaming some abstract force (“epidemic”) for your lot in life, and get on with accepting and accommodating your son’s needs. I mean this with love. my son has no receptive language and cannot tell me anything. every time he hurts himself i feel the pain too. every time. it is exhausting, having to rescue him from himself everyday. or to watch him regress over and over. Thank you for sharing your experience. I can relate to much of what you said. Life is short, you’re right..
What if the job you are trying to do is just too difficult? What if it is really just too much work, too much stress, too much pain for any one person to handle? I know you are doing it, so in some sense it is survivable, but you are chronically depressed, sleep-deprived, stressed out, anxious. If this were a job causing this, everyone in your life would tell you to quit. Because it’s your kids, you can’t quit, of course. But how long can you keep going? Now you’ve got an invalid wife again. It’s really a miracle you can get up in the morning. I don’t know that there is an answer here, but at various times in my life it has helped me to realize that burdens can be heavy enough to be basically incompatible with healthy human life. For most people these periods are short, but for you, I really worry. Sorry, that comment doesn’t read the way I meant it. I meant to say that your job really is hard, maybe too hard. I respect you for going at it every day and mustering the energy necessary to go ahead. And also, I do worry about you and I hope things will get easier. Thank You so much for caring. Yes, my job is hard and finding the energy sometimes is not easy. Having said that, it’s entirely worth it and I’ll be just fine. As I slowly begin to financially stabilize, we can make improvements to our lives that make this gs safer, less stressful and more efficient. I don’t expect this to really get easier but I do believe that I’ll continue up to find the strength to move forward. 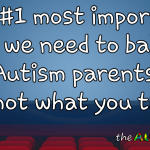 What is it you think parents without autistic children take for granted? Other parents also have appointments,meals, house cleaning, tantrums, sports, homework, jobs. All of these things. Maybe not to the same degree, but you act as if people don’t understand or get to see it from your side. Have you ever tried seeing from their side? And now with Lizzie back, isn’t this easing up a little for you? Can’t she take some of this weight? I meant no disrespect but you don’t get it… It’s okay that we don’t agree. It doesn’t take anything away from what you do to say yes all parenting is exhausting. I said it wasn’t the same level, but it’s like you refuse to be anything other than ‘the worst off’ when that’s simply not the case. All parenting is hard, just different levels of hard. It’s ok for you to try and say that without a but at the end of it. I may not have therapy sessions with 3 kids. But often times I have 2 kids that have to be at different places at the same time and only one of me. Both stressful, just different. There is a world of difference and whether you choose to acknowledge that or not is up to you. It’s like saying that walking on the side walk and walking in the moon are the same thing because walking is walking. 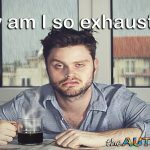 Moe – I have been “regular parent tired” and “special needs tired” and I will tell you that right now Rob is probably too tired to even explain the difference. This isn’t about testosterone level or having to be in two places at once. This is the difference between “black lives matter” and “all lives matter.”. It’s about perception. Did her cousin have a clue? No. But she was relating my friends experience to the worst she had ever experienced with HER child’s health. That was the only thing she had to draw on. The worst she had known personally. Moe – I am grateful for you that being tired and dealing with tantrums and picky eaters and two sporting practices at once is the worse you’ve known. I know it’s bad. I also know if you traded lives with Rob you would experience a whole new level of “the worst” and your current worst would begin to resemble a picnic. It’s all about perception. When moms of toddlers say “I haven’t slept more than four hours at night for six months” mothers of newborns are like “wtf is four hours of sleep?” because they haven’t slept four hours since they were eight months pregnant. You think you’ve got it bad with a difficult teen until your friend’s teen commits suicide. Then you’re ready to pay for the difficult days. It’s perception. All of it. No one is saying regular parenting isn’t difficult. It is. All lives matter. But there is sometimes a complete disconnect about just how horrific special needs parenting can be. I think that’s pretty much all he’s saying. Namaste. And I’m not trying to take away from what Rob and others are doing. But when he is just flat out dismissive of others it’s hard to try and relate. I even said they weren’t the same. But I started out with a question he totally ignored. I wasn’t trying to pick a fight. I was asking. Again, saying they weren’t on the same level. Moe, I think you assume that I’m being dismissive because I don’t directly state that all parenting is difficult. I’m not. 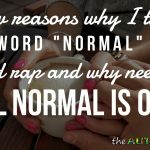 This is a special needs parenting blog and as such, I talk about special needs parenting. I’m sorry if you feel I’m being dismissive but I’m truly not. At the same time, Kim is absolutely right in how she wisely put it. This isn’t about comparing paper cuts because both cuts hurt. 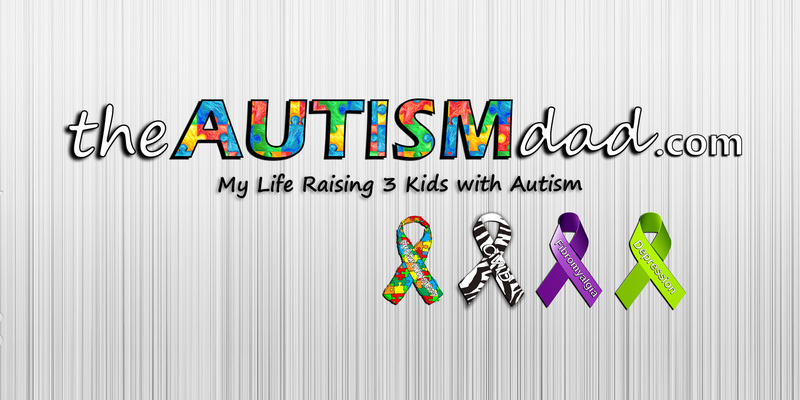 It’s about trying to provide insight as to what my life as a special needs parent is like. While I’m speaking only for myself, in many ways, I’m speaking for many more than just myself. 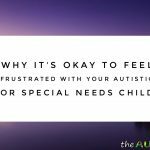 I know that I’ll likely never be able to adequately help the rest of the world to understand just how different special needs parenting is and all the countless struggles we face on a daily basis. That said, if I can reach people who are feeling alone and isolated, maybe by reading my words, they’ll realize that they aren’t as alone as they think they are. When people sorta pick apart my words and try to say that I’m not acknowledging that all parenting is tough, they are missing the entire point. I truly mean no offense by this but those that get it, don’t even have to leave a comment because there’s nothing to say. Those that don’t get it, tend to leave comments and somehow try and critique me. Everything in life is relative and I would never directly compare what I go through to what anyone else goes through because I’m not in their shoes. 1) Getting your kids to simply wear clothes. 2) Not having to micromanage your child’s environment, just to limit the overstimulation and Meltdowns. 3) Speaking of meltdowns, they are not the same thing as a tantrum and shouldn’t be compared..
4) While your child may be a picky eater, mine will literally starve themselves if their meal doesn’t look right, if one item touches another on their plate or if it’s sensory offensive in some other way. 5) Your Kids may sneak out with their friends and that’s dangerous but at least they have friends to sneak out with. 6) Your child may back talk or be disrespectful but mine can’t even speak or tell me how he feels. 7) while it’s always terrible to see a child who’s ill it’s not the same as seeing your childs brain stop working correctly and they almost die as a result of their body not maintaining blood pressure, body temp or heart rate. 8) In most cases, you can go to your child’s teacher conferences and work out any issues you may have with your child’s education. We have to go to IEP meetings and fight for everything our child needs. 9) While you’re watching your child score a goal, hit a home run or even just ride the bench, we are in countless therapies just so our kids can walk, speak, tie their own shoes or even chew their own food. 10) In most cases, your child will grow up, leave the nest and build a life of their own. We lie awake at night praying to outlive our children because when we die, there will be know one to take care of them.. 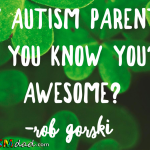 Rob all i can say is you are doing an amazing job and yes i totally get it…i have 2 children but only my son is in the process of being assessed for autism,which in itself is frustrating because we are struggling to get some help without a diagnosis. He starts kindergarten next year and im so thankful that we do have a government funded place called ECIS-early childhood intervention services and they are able to help with teacher support etc for now and next year. My son also has sensory issues and yes would rather starve than eat something his senses can’t handle and he struggles with keeping his iron levels up as he won’t eat any meat except processed hamburgers or sausages and i need to physically feed him most times to get vegetables with iron into him so that he is not totally reliant on supplements. So i take my hat off to you Rob as i struggle with 1 special needs child and you are doing wonderful to be doing that with 3 ☺ thank you so much for putting forth all your thoughts and feelings. You don’t understand. You can make a meal and everyone will eat it or if they don’t, no biggie. In our world, food or lack of food may affect their meds or weight loss. While typical kids are playing sports and growing up, our kids can’t and so it’s a constant battle of what will keep them happy. Not helicopter parent style but everything literally bothers them from the touch of their clothes to sounds in the house and wait until they get older! Then the meltdowns are different. They’re older, bigger and stronger. They’re depressed as much as I am. They have no friends or want a job and a girlfriend but severe anxiety or lack of social skills for their age gets in the way. It is. It a normal situation. Your desire to fix it and make it better never goes away for any parent but in our world, there’s so much that needs “fixing” and the mental health aspect becomes a huge issue as they become young adults. While most parents are living through the high school years and kids getting drivers licensss, prom, jobs, college or full time jobs…we aren’t. Some of our kids will never drive even if they have the desire or a job that sustains them independently; that is if they can even live independently. So while you are living it up and chillin and your kids are living there lives, we still have “kids”, albeit in their early 20s to take care of.